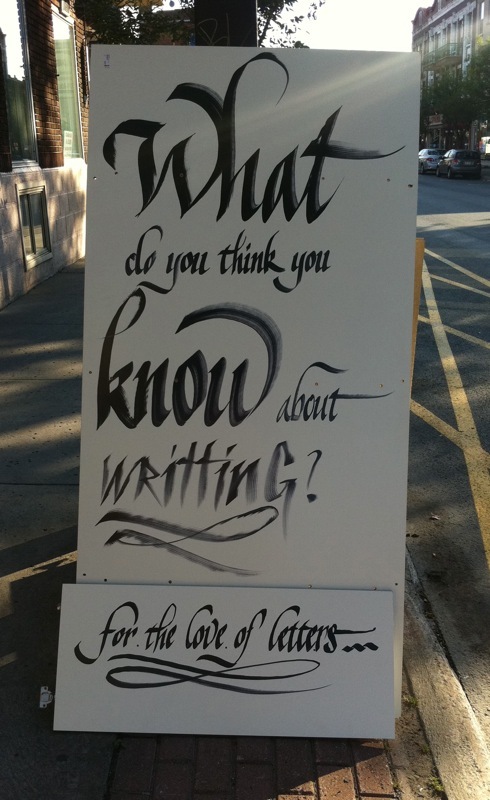 This gigantic calligraphic question might sound a bit arrogant, but the fact that “writing” is misspelled makes it funny as well. This is part of the cluster of handmade signs that I spotted in Montreal. (Please see my previous post.) The small sign here, “for the love of letters”, suggests the artist’s motivation for creating these one-of-a-kind messages. And yet they’re abandoned on the street. Gifts to strangers maybe? I wouldn’t be surprised if someone walked off with a sign or two after I took the photos. This entry was posted on September 15, 2011 at 3:19 pm and is filed under Script. You can follow any responses to this entry through the RSS 2.0 feed. You can leave a response, or trackback from your own site.